Release date January 1, 2007. On this inspirational DVD program, Esther and Jerry Hicks present the teachings of the Non-Physical entity, Abraham, whom Esther calls “infinite intelligence” and Jerry refers to as “the purest form of love I’ve ever encountered”. “I wanted to ask about this Emotional Scale. The anger and the rage are just SO uncomfortable. It’s much more comfortable to stay around in depression than to go through it.” She also has a question about affirmative prayer and her need for a cane. “I would like to propose we substitute the word ‘want’ with the word ‘have’.” Abraham responds to the idea that “wanting” could be a bad thing and talks about those seeking to be desireless. “If the beasts are free of resistance, shouldn’t that make them even more powerful creators than we are?” Abraham talks about our relationship to the animal kingdom. AND a discussion about the science of mantras. Are they more than just meaningless words? “Over 20 years ago, I had this magnificent ability to heal with my hands. There were a number of times when someone would be in pain, and when I would apply my hands, my hands would get very warm and the pain would go away.” And a discussion about the differences between healers and a teachers. “Sometimes I get in a place – whether it’s with work or with relationships – when I don’t know what the outcome is going to be, and I immediately go to the negative.” Abraham talks about reaching for a new vibration. What a joy! A DVD with no bells and whistles, simply Esther Hicks standing in front of a Los Angeles audience speaking the wisdom of Abraham. Occasional shots of Jerry Hicks and many shots of the audience add to the interest, as we see reactions to Abraham’s wonderfully wise words communicated with such love and humour! ”¦I found I was able to relate to and benefit from many of the answers to the questions, and even when the questions weren’t of particular interest to me, I still found myself getting a lot out of watching the DVD because the whole experience is such fun! 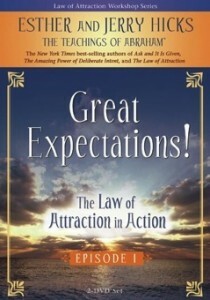 So, if you want to understand the Law of Attraction in action, laugh a lot, and raise your vibration, feast on this! This is a perfect supplement to any of the Esther and Jerry Hicks books. Watching and hearing Abraham in action is awe-inspiring. 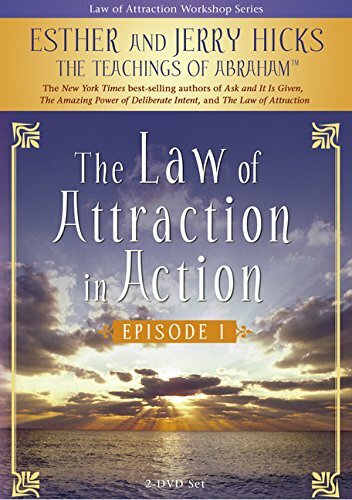 The DVD adds another dimension to understanding the Law of Attraction. I highly recommend it to those curious about the topic and those already using the principles. My husband & I watch this DVD over and over just to feel the magic. I love the format. Each question begins with words mysteriously appearing on a black screen creating a focus and a vibration of expectation that is different from the other DVDs. It is almost like a meditation. Within this mood, magic happens as the question is asked and Abraham answers. In this magical mood, we really get it when the answer comes. Too cool! ”¦ it helped me gain more understanding of their books. Pieces began to string together in an “ah-ha” moment after moment. … There were some moments that I laughed so hard I had tears running from my eyes. This is an exceptional workshop, even for Abraham, and I fell in love with every person who sat in the chair! I’m continually amazed at how I can apply the answers to vastly different situations in my own life. ”¦I know to the average Joe the idea of channelling sounds pretty hokey but you need to watch this video. Esther never misses a beat. She has the perfect answer and the gentlest way of presenting truth. ”¦It is uplifting and the best information I have ever heard. You will hardly notice the time spent while watching this. The kind, humorous and loving way that Abraham communicates is so beautiful that you cannot help but experience the joy of the process and feel joy for those who are receiving the wisdom that is offered in answer to their questions. You can see the joy. The change in their countenance and their tears. It is a most moving and enlightening experience. If you have ever attended a seminar, you will be pleased to have this to view over and over again. If you have not yet had the chance, rest assured that NOTHING is lost in the translation. ”¦ Whatever your belief system or philosophy may be, this is a riveting presentation. I watched it in one sitting, and was totally blown away! I watch it over and over and am still amazed at the information. Whether you believe in God or non-physical entities or not, you will love this DVD set and the wonderful information it contains! Some people might have barriers go up when they hear that “Abraham” is a group of non-earth bound entities”¦ Please, please, don’t let that stop you from buying this DVD set and soaking up the Divinely Inspired information that comes through Esther. ”¦the precious jewels about living a happy and prosperous life that come out of her mouth in this DVD are truly inspiring and life changing. She is funny, direct and incredibly insightful. Every time I watch this DVD, I pick up something that I didn’t hear before or maybe wasn’t ready to hear. ”¦You can see the release, joy and inspiration on the faces of the people in the audience as Abraham, through Esther, talks to them. I got the chills many times while watching it! You know truth when you hear it. ”¦Abraham skilfully and deftly answers questions from the audience, gives sage advice, and imparts wisdom for living with humor and simplicity. You will return to this DVD many times to renew your thought process and to gain new and creative insights for enhancing your personal life experience. A must see for anyone seeking to improve themselves spiritually, mentally and in all practical matters. ”¦I don’t care if Esther Hicks is channelling Abraham or not. Everything that is said makes perfect sense. ”¦ there are nearly 4 hours of Abraham taking on people’s concerns and helping them to clean up their vibrations from a wide variety of perspectives”¦I enjoy watching the dialogues over and over. Have to see it for yourself & take it in. This is something that everybody can benefit from watching. This is the best material that has ever come to me. I watch this DVD so many times. The first time I cried out with joy of being able to receive such pure and loving and benefiting information from pure undistorted source. I said to myself god finally speaks to me after a long quest. Every time I revisit the DVD, new insights will spring out. There seem to be so much truths and healing information contained in just one single DVD that after 5 times of watching it, I am still finding some new extraordinary insights and understanding. For those who just read Abraham’s book and have not seen the DVD, I highly recommend it. You will never be disappointed and it is worth everything. For those who are fans of Abraham, I guess you know full well what I mean. Esther and Jerry Hicks produce leading-edge Abraham-Hicks teachings on the art of allowing our natural well-being to come forth. While presenting open workshops in up to 60 cities per year, the Hicks have now published more than 700 Abraham-Hicks books, cassettes, CDs, videos, and DVDs.